Both the name and the idea came to me while trying to help someone at the service “Counter” – that’s where the “Counter” came from – understand the “what” and “why” of their particular vehicle failure despite their lack of knowledge. Many times, that lack of knowledge can be surmounted by education and understanding as the majority of vehicle failures are mechanical in nature; caused by lack of maintenance, poor design or abuse. As a result, most are fairly logical and not all that difficult to understand if you understand what makes the vehicle start, stop and go down the road. If you understand what it takes for the vehicle to go down the road, understanding why it won’t isn’t that much of a stretch. Understanding is where the “Intuitive” comes from. There is another reason I’ve chosen to call the content shared here “Counter Intuitive” and its explanation will serve as the first of what I hope will be many such conversations. Vehicle maintenance… or, lack there of, is one of the major causes of vehicle failure and/or poor performance and yet a week doesn’t go by without a story focused on unnecessarily aggressive service intervals appearing somewhere in the media. Virtually every major ‘player’ in the industry, including the Automobile Club, has voiced an opinion of what an appropriate service interval should be. Many of those opinions defer to what the individual vehicle manufacturers suggest is appropriate in the Owner’s Manual, which in some cases can exceed 10,000 or 15,000 miles between changes. Contrary to what you may think, even though I’m an independent repair shop owner and have a vested interested in seeing you and your vehicles regularly and often, I don’t have a problem with those who insist the old maintenance model of bringing the vehicle in every 3,000 or 4,000 miles or every three or four months is no longer necessary. But, just because I don’t have a problem with it doesn’t mean I agree. What they are saying makes sense. It is intuitive – that other word again. The quality of lubricants available today is superior to anything available in the past. Computerized Engine Management and Fuel Delivery Systems have passenger cars and trucks running cleaner and more efficiently than ever before. Consequently, there are fewer contaminants that need to be removed more often. But, there is something happening in the background, something “Counter Intuitive:” something that despite the logic goes against what you may believe and makes no practical sense. While the vehicle manufacturers, and everyone else for that matter, insist that it is perfectly alright for you to go 10,000 miles without servicing your vehicle: without changing your oil, they will also tell you that it’s perfectly alright – normal, in fact – for your new, fuel efficient, high-tech vehicle to burn a quart of oil every 850 miles to 1,200 miles. 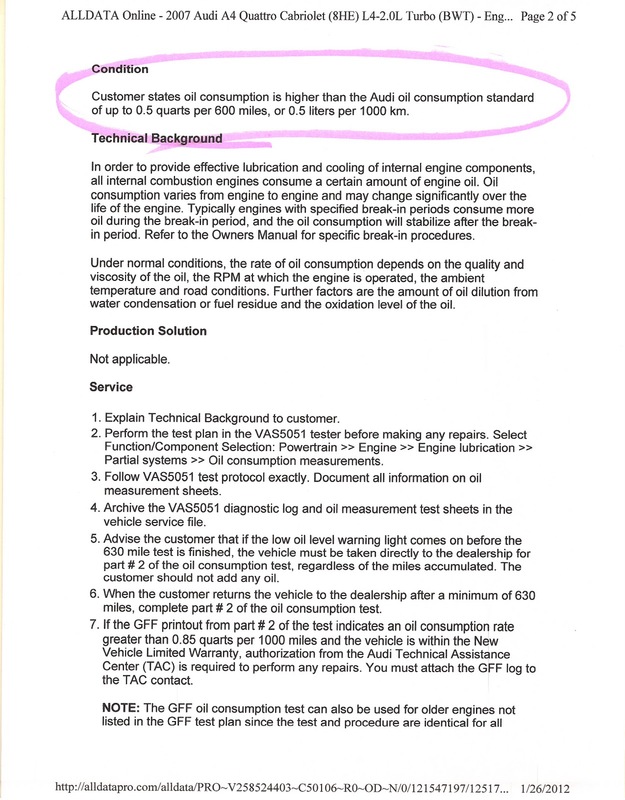 You won’t necessarily find this in your Owner’s Manual, but you almost certainly will find it in the manufacturer’s technical literature in the form of a Technical Service Bulletin designed to help you understand that it’s OK for your new car to consume infinitely more oil than your old car consumed. And, here is where logic and intuition can become both costly and dangerous. In an age of self-service fueling stations, hoods are rarely raised and oil is rarely checked. If you drive your vehicle for 10,000 miles you could conceivably ‘burn’ between eight-and-a-half to more than eleven quarts of oil. There is only one problem. Few vehicles have more than a five or six quart crankcase capacity which would leave most vehicles dangerously low on lubricant unless or until a warning lamp alerted them to the problem! Here is a pretty dramatic example of exactly what we’re talking about here… All the oil drained from two different vehicles, both of which have crankcase capacities that exceed five quarts. Just so you know, these are empty, one-quart Gatorade containers and both vehicles came in with severe driveability symptoms (rough running/poor performance) and both left with the oil changed, crankcase full and running normally! 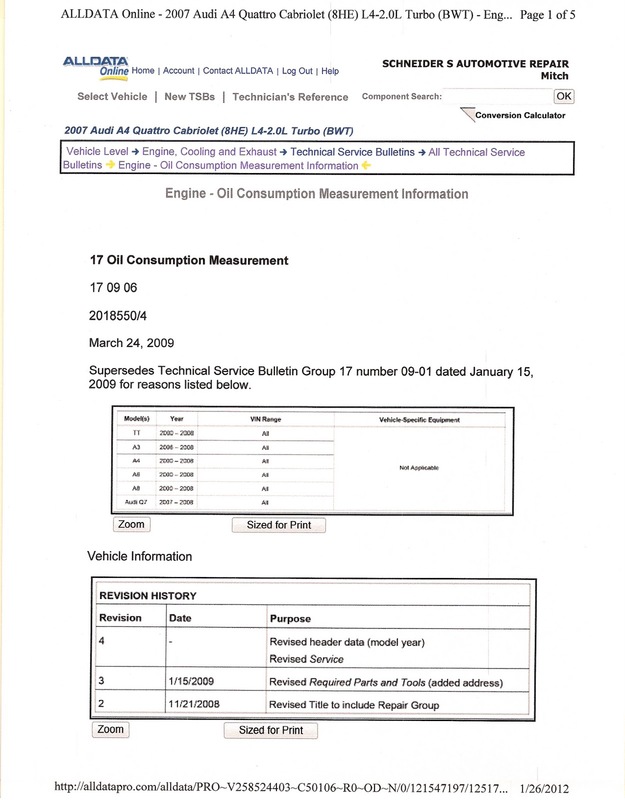 There is a response to this conundrum that makes sense and that is embracing a new paradigm: a paradigm that suggests longer service intervals – bringing the vehicle in very 7,500 to 10,000 miles for oil service, but scheduling one or two appointments with your dealer or independent service provider purely to ensure every major system on the vehicle is operating within normal operating parameters. That way, someone, a trained professional, is looking at the vehicle to keep little problems from becoming big, ugly, expensive problems! That’s what I think… What’s on your mind? If you have any questions you’ve always wanted to ask your automotive service professional, but were afraid – or, reluctant – to ask, this would be the ideal, non-threatening environment to share your questions and concerns!